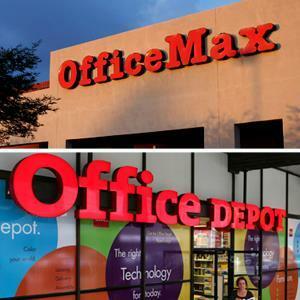 Office Depot and OfficeMax: Stronger as One? The market initially reacted favorably to the news this week that Office Depot (ODP) will acquire OfficeMax (OMX) in a stock swap valued at $1.2 billion. That enthusiasm has tempered in the wake of investor calls in which neither company seems to have a plan for how to make the merger work. But that does not change the fact that the economics are compelling. The #2 and #3 retail office supply chains have been struggling for years to compete with the sector leader, Staples (SPLS). At the same time, all three are suffering from increased competition from web retailers and discounters such as Amazon, Costco and Wal-Mart. The numbers paint the picture – and it’s not pretty. The table below presents three key financial metrics that add or subtract from enterprise value – revenue, gross margins and EBITDA – as well as enterprise value for Staples, Office Depot and OfficeMax – in 2012 and 10 years ago, in 2002. Keep in mind that all three companies were founded at roughly the same time in the mid to late 1980s, and today sell essentially the same products to the same types of customers at the same price. It’s important to note that these numbers do not take into account that the stock of all three companies rose on the news of the Office Depot-OfficeMax merger. Let’s take these key metrics one by one. Revenue: Office Depot and OfficeMax revenue growth was flat over the last 10 years. But because of market positioning, financial strength, more strategic M&A and historically better management, Staples grew revenue from $10.7 billion to $24.5 billion. That’s an 8.6 percent compound annual growth rate (CAGR) and a 140 percent increase overall. Gross margins: Staples and Office Depot gross margins were essentially flat over the last 10 years while OfficeMax gross margins grew significantly, from 19 percent to 26 percent. EBITDA: After climbing to a high of $1.1 billion in 2006, Office Depot EBITDA fell precipitously in 2007 and again as the recession took hold in 2008 and 2009 to a low of $222.3 million in 2010. Today it’s $375 million. OfficeMax EBITDA hasn’t shown nearly as predictable a decline, but it too has dropped steeply to $196.3 million. Meanwhile, Staples EBITDA has grown fairly steadily over the past 10 years, although its 2012 EBITDA of $2 billion is a small decline over the previous year. Enterprise value: The enterprise values of all three companies are down from their EVs 10 years ago. Staples’ EV of $8.3 billion is lower than its EV in 2002 and is down significantly from its zenith of $19.1 billion in 2009. The EV apex for Office Depot was $10.9 billion in 2006 and for OfficeMax, $5.5 billion, also in 2006. First, I have long held that if a company cannot grow its top line, enterprise value is inevitably destroyed over time. That’s clearly the story of Office Depot and OfficeMax. Second, in some sectors, even revenue and profit growth isn’t enough to grow enterprise value. That’s the Staples story. With overall revenue growth of 140 percent and a more than doubling of EBITDA over the past 10 years, Staples EV didn’t improve at all. Either Staples is a greatly undervalued company – as I believe – or investors are wary of any traditional company in the space because of new competitive threats. In other words, Staples may be the best house in a bad neighborhood. But investors don’t even like the city. Which brings me back to what is so enticing about the Office Depot-OfficeMax merger. Execution issues aside for the moment, for starters Staples is proving that size isn’t everything, but that bigger is definitely better. The two companies combined would have starting revenue of just over $18 billion, compared with nearly $25 billion for Staples. Even more compelling are the reports that the merger will allow significant cost efficiencies for both companies. Daniel Binder, an analyst for Jefferies & Co., estimates that the combination could generate as much as $580 million in cost savings. Given that together Office Depot and OfficeMax delivered just a little more than $570 million in EBITDA in 2012, in theory the merger could double the profitability of the new entity. That’s a pretty strong start, if the new management team can execute the merger well. And with these two companies, that’s apparently a pretty big “if.” Doing M&A deals is hard enough. Making a combined company successful is even harder, and these are large companies with different cultures, philosophies and management styles. In addition, about 50 percent of their store territories overlap, which means store closures and job cuts are inevitable. That’s always disruptive. Both Office Depot and OfficeMax have been closing stores and eliminating jobs for years as part of survival strategies. In many ways, it’s like pruning trees. If you do it right, the tree thrives. If you do it wrong, the tree can die. Only time will tell if Office Depot and OfficeMax are up to the task. But if they can successfully integrate, there is no question that shareholder value can be substantially increased. But then what? If the new management team executes well, what can the market expect? First, the new company will have significantly more and more focused direct customer relationships – primarily small to medium-sized business. These relationships are an extremely valuable asset that can be leveraged to enable the new company to offer more and more higher value services. Both companies already have huge catalog and online businesses and standing orders from customers for commonly used office supplies that provide, in essence, recurring revenue. It may be a small leap from this type of revenue to more formally packaged, sold and supported managed services, which can dramatically change the profile – and ultimately the business model – of the company. Second, fortified by scale and improved financial performance, the new company might also become an attractive partner for companies looking for new channels for their solutions. Examples include wireless carriers with services and equipment such as smartphones and tablets, solutions providers with hardware, software and technology integration services for small businesses and companies that sell project-based services such as large Indian or mid-sized U.S. outsourcers. Remember it came as no surprise to anyone who knows the three market leaders that Apple selected Staples to sell Apple products, shunning Office Depot and OfficeMax. That could change if the two companies are stronger as one. But it will take some time for the two companies to come together and there will be bumps along the way. In the meantime, Staples will have an operating advantage. Some customers are likely to defect. Longer term, there is more than enough business in the sector for two large companies. And with a stronger competitor focused on growing its business, rather than just surviving, the market will be more rational. This will benefit Staples because weak competitors can do crazy things that disrupt the market just to survive, for example, undercutting on price to win business without regard for margins or profits. So while no merger comes with a big red button that can instantly fix all problems with one push, the Office Depot and OfficeMax combination is as close to “easy” as it gets – at least on paper. It should happen. It likely will happen. Then the hard part begins. Marty Wolf is president and founder of martinwolf M&A Global Advisors. Marty has been involved in more than 115 IT M&A transactions during the last 16 years. He has actively traded shares of both Staples and Office Depot between 2002 and 2012, and holds positions in both stocks now.